Can a well-designed interior make for a better you? We are proud to launch our pop-up programme of events and exhibitions “Sto Werkstatt presents…” with an evening discussion that will unpick how design contributes to your mental and corporeal wellbeing. 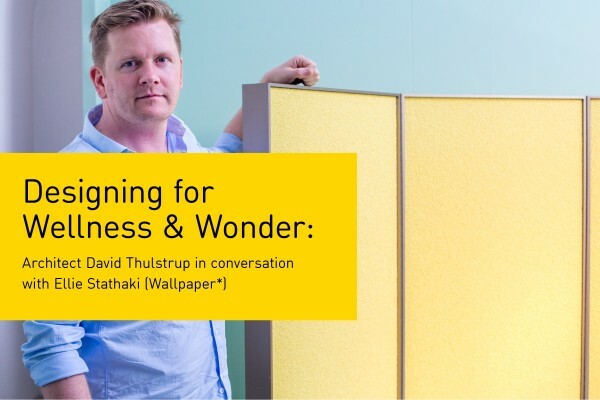 A master in the composition of sensuous materials, colour and form, rising Danish talent David Thulstrup will be joined by Ellie Stathaki (Architecture Editor, Wallpaper*) to reflect on Studio David Thulstrup’s recent contribution to the Wallpaper* Handmade exhibition ‘Wellness & Wonder’ (Salone del Mobile, Milan ,17-21 April 2018). Sto had the pleasure to collaborate with Studio David Thulstrup for the exhibition, exploring new possibilities of our StoSilent acoustic’s range which resulted in an elegantly poised paravent screen, designed not only to provide guests with a nook to rest in, but also to ease the cacophony of Milan’s buzzing design hungry crowds. Taking the Milan exhibition as their starting point, ‘Designing for Wellness and Wonder’ will explore David Thulstrup’s notable projects including VIPP hotels, Noma 2.0 Restaurant and TABLEAU; Each project exemplifying how the sensual qualities of materials and design of space may contribute to a sense of comfort and livability. The Council Chambers of the former Bethnal Green Town Hall are the antithesis of an interior intended for individual betterment. Conceived as a flexible space for the council’s extension to their building, which was completed by architect E.C.P. Monson in 1939, the chambers are formal and calculated in their format: designed to enhance group discussion, thought and governance. London based, RARE architects were invited in 2010 to restore the building and also add to its volume with an extension. The extension to the building, a new wing that stands behind the original 1910 structure and an additional floor that sits atop the flat roof of the 1939 extension, bestows an air of opulence and comfort to the architecture which is now repurposed as a luxury hotel.